I'm astounded by your interest in sculptors so please see if you can work out what has happend with these memorials if you can. Were they all cast in the same mould? Or cut in the same way? Thanks for the postings - I thought that there may have been more but didn't know where. All done by the same sculptor or company do we think? I don't have too much information on these monuments but I would guess they are copied from the same original work. Sculptors would model the soldier in clay and then have this cast in plaster. They would then use this plaster maquette and a pointing machine which is basically a kind of frame work which allows you to transfer measurements of depth from the maquette to the block of stone and the sculptor would drill points into the stone which were of the correct depth to be carved and then carve down to this point. As I said in another post granite was an important industry and there were a few big companies in Aberdeen and the South West which were big enough to commission lesser known sculptors to model the figure of a soldier for them in clay and then have this cast into a maquett (they would also employ architects to draft up some generic designs for the complete monument. The company would own the copyright and would use this to produce several monuments with their own granite masons using a pointing machine and the maquette to carve the soldier in granite. I know of a few instances of this. Artists would often use a small maquette as a guide only to the work, scaling it up with the pointing machine and allowing themeselves more freedom in their approach as they carved the final sculpture. The granite companies always seem to have commissioned full scale maquettes though, I would assume that scaling up might have been beyond a typical granit mason and anyway the mason was expected to carve an exact copy of the maquette with no allowance for personal style (with pneumatic tools an exact copy could easily be carved even in granite). 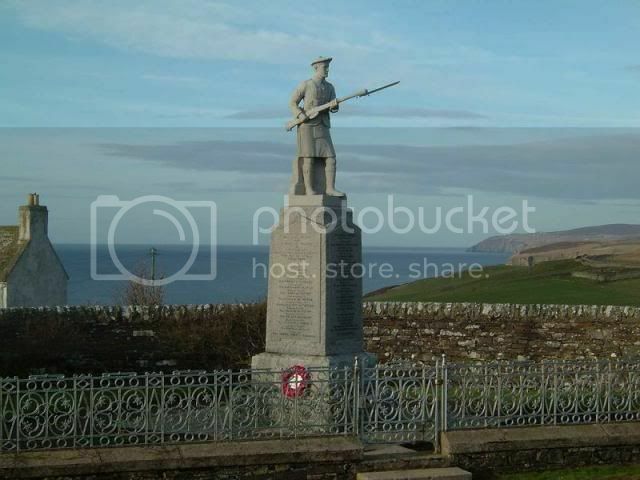 I am sure that this is why there are a number of these monuments which feature a soldier in flatcap and without a kilt, even in Highland memorials where the kilt would be expected, the companies were looking for a generic figure which might sell anywhere in the U.K.. I think the Newcastleton figure is probably the same but with a re-modelled head. I have found the best way to check is to look at and photograph the back of the soldier. Even the same mason carving from the same maquette can produce a slightly different face and hands, but if the layout of the webbing and kit are identical then I think its safe to assume the figure has been carved from the same original. I suppose its useful to remember that for some in the years after WWI war memorials were big business. It doesn't quite fit in with the sentiments that led to these memorials being set up...but there you go! I would think that the business records of some of these big companies like Stewart & Co. and Morren & Co. in Aberdeen might still be available and would definitely make for some interesting research. Unfortunately I've never had the time but anyone up in the North East could maybe have a go? 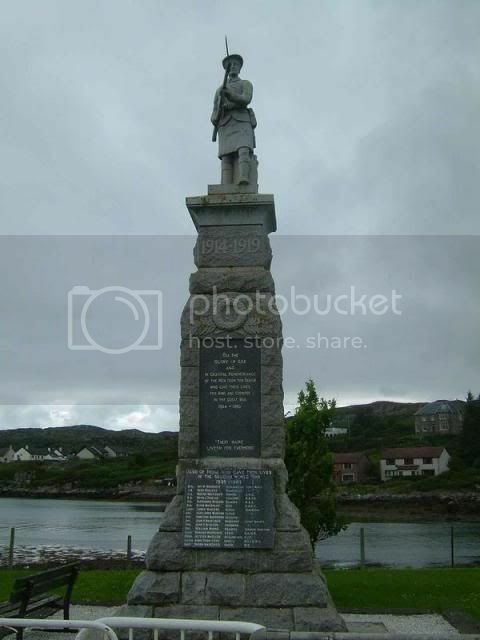 I've never noticed any company named on the Liddesdale Memorial but I will look next time I'm there. 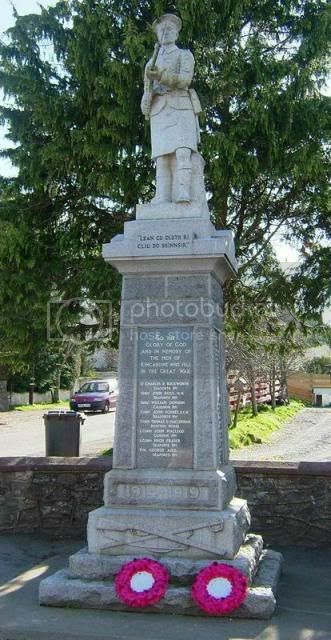 Ferniegair memorial in Lanarkshire, posted by David, looks to be in the same style as well. See also a new thread on memorial designs which have been used more than once. Jim mentions it in a post above but the few years after the First World War were very busy ones for monumental masons. 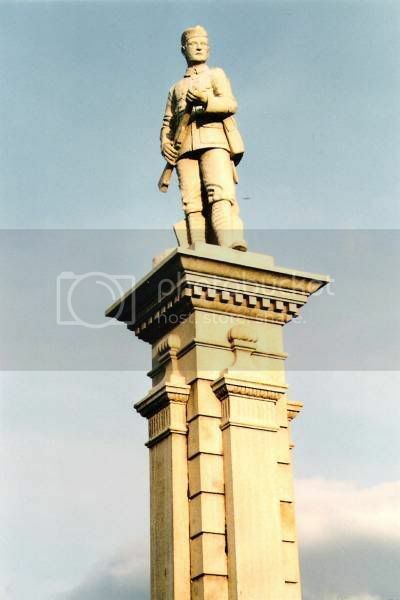 The big firms such as Messrs. Scott Rae of Glasgow and Stewart and Co. of Aberdeen could competitively tender for commissions from war memorial committees using designs aleady completed. Smaller monumental mason firms could offer scaled up versions of gravestones for memorials such as celtic crosses or obelisks. Many communities did go for expensive architect designed memorials, but it looks like many more went for slightly cheaper "catalogue" memorials. The same goes for brass plaques in churches. Over the few years we have been recording memorials I think I've seen certain styles of brass (or gold on steel) plaques being repeated across the country. 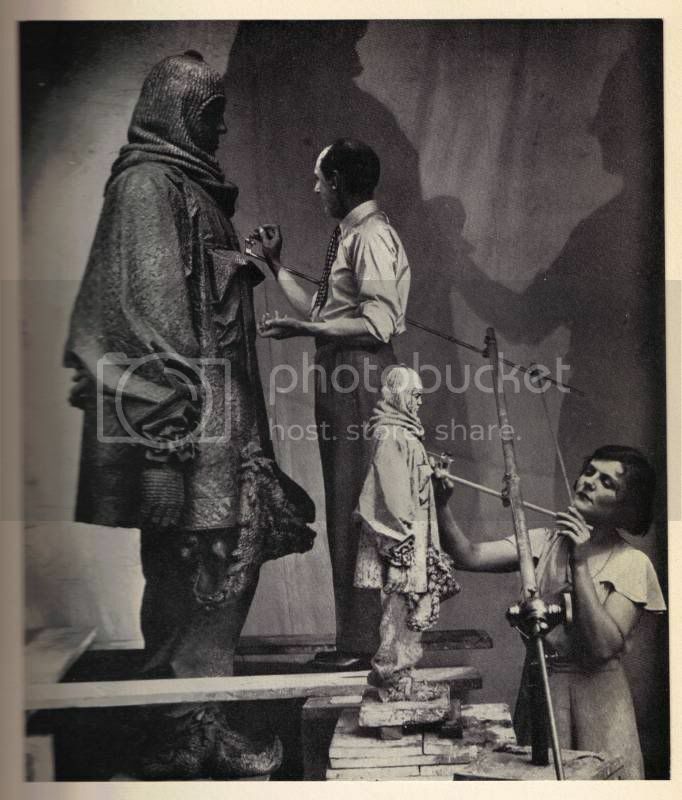 Thought I'd add this phot of Charles Sargeant Jagger using a pointing machine, with his wife, to model the full scale sculpture of Scott of the Antarctic from the original sketch model. Jagger was resonsible for the Royal Artillery Memorial.